As the debate over police-related violence persists across the country, some critics have taken it upon themselves to monitor law enforcement across America, increasingly turning to a controversial tactic known as cop-watching. "Going out, filming police officers, basically in acts of self-defense. ... Cop-watching is a direct action tactic," said Antonio Beuhler, co-founder of the Peaceful Streets Project, a grassroots advocacy group based in Austin, Texas, dedicated to increasing police accountability. Beuhler, a veteran of the Iraq war and a graduate of West Point and Stanford University, said he took up cop-watching after his first run in with the police three years ago. An officer was caught on camera assaulting him at a gas station in Austin, after Beuhler had verbally intervened in what he thought was an act of police brutality against a woman the officer had pulled over. "I've been arrested now five times cop-watching, and I've had 10 different charges filed in the courts against me," said Beuhler. "Its expensive, time-consuming, and every night in jail is misery." The practice is especially relevant given the current scrutiny police are under following the Michael Brown shooting in Ferguson, Missouri and the Eric Garner chokehold death in New York City, both of which generated large-scale protests after grand juries declined to indict the officers involved. While the protests attracted nationwide attention, many in the law enforcement community have voiced grievances over how they have been portrayed, notably in New York City. Cop-watching involves observing, filming and sometimes confronting police officers if they're believed to be overstepping their authority. The Black Panther Party is credited with launching this kind of "policing of the police" activity back in the late 1960s. However, unlike the Black Panthers, none of the members of Beuhler's organization carry guns when they cop-watch. "We don't want to give the cops a really convenient excuse to kill one of us," said Beuhler, holding his arms up. "We don't want them to say, well he was armed so ... "
This concern does not define all cop-watching movements. In a town just outside of Dallas, there is a group of activists who cop-watch while openly carrying firearms. On a recent Saturday, Kory Watkins stood in front of Arlington City Hall before heading to a protest in front of Arlington police headquarters. "On our open-carry walks we were seeing the overreach and the police brutality firsthand - on our open carriers and other people as well - so, we transformed into a cop watch group," said Watkins, an Arlington resident and father of two who leads this group of activists. 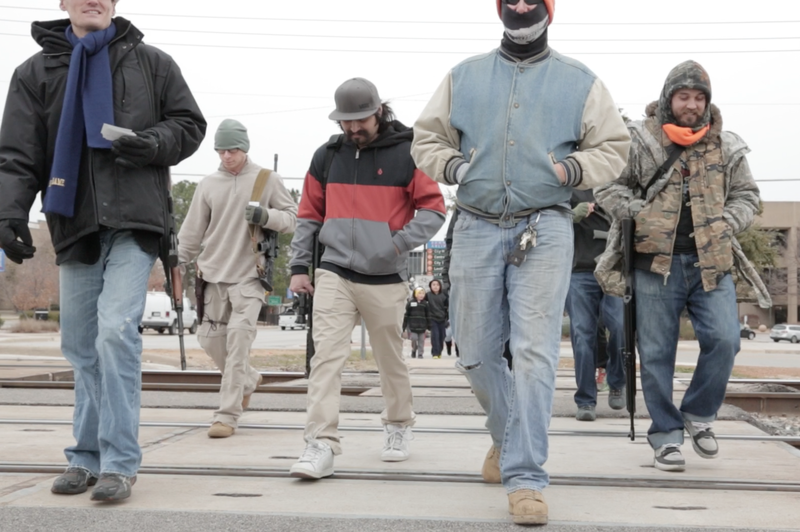 This group of open-carry cop-watchers comprises dozens of members loosely associated with North Texas Cop Block and Open Carry Tarrant County -- two groups dedicated to monitoring law enforcement while also campaigning for changes to the state's open-carry gun laws. "I do it for educational purposes," said Rene Frias, an open-carry cop-watcher and friend of Watkins. "All these laws, they strip away our rights." He pointed to the AK-47 slung across his chest. "It's ridiculous that I can carry around this hunk of metal, and I can't carry a handgun." Texas is one of six states where the open carry of handguns is not permitted. Current legislation states that handguns must be concealed and each handgun requires a permit. However, the open carry of long guns such as rifles and shotguns is permitted, provided it's not done in a manner meant to cause alarm. New Texas Gov. Greg Abbott has supported a new bill that would allow the open carry of smaller firearms. Watkins' group also supports this bill. Members told CBS News that they cop-watch at least once a week, and they also carry long guns on display almost every day, around Arlington streets, restaurants, cafes, and surrounding towns. Asked about how the group feels about the police, Watkins said: "I think they've just lost their way and they're being trained wrong." "I pay them to do their job," he added. "So why can't I show up to where they're at with a gun? I'm their boss." According to Lt. Christopher Cook, a spokesman for Arlington Police Department, cop-watching has been going on there for about a year, and five arrests have been made since September, when open carry began to feature as part of most cop watches. "In majority of the circumstances the openly carrying of a weapon as long as it's not displayed in a manner calculated to cause alarm, can be lawful -- not in every -- but in most," said Cook. "It's not just one thing, it's not just showing up on a traffic stop with a rifle; it's coupled with the fact that they're in close proximity, that they're distracting the officer, yelling at the officer to the point that they have to divert and focus their attention on this individual who's armed," he added, saying how this was occurring with more frequency in recent weeks. "As police officers, we can't become desensitized to people or a group of people carrying firearms." According to Watkins, it's the police who aggravate and intimidate. "We stand plenty enough room for the officer to do their duty and the officer to do their work - it's very simple, you just sit there film and record," he said. "We're peaceful when we do it." The dynamics between police and activists didn't seem that straightforward when officers tried to detain Frias, who was standing at a busy intersection in Arlington carrying a megaphone and his rifle. "I was merely exercising my First and Second Amendment rights," he said. For about half an hour, a handful of activists and about five police officers stood on a street corner filming each other using smartphones and compact cameras, trading terse words about who was encroaching on what rights, before police drove off without making any arrests. A few days after the incident, Watkins' group joined hundreds of activists in Austin, Texas, at a rally in support of new open carry legislation, which could potentially add more guns into confrontations with police.